Jack Nicklaus and his wife Barbara with US Ryder Cup captain Davis Love III and a selection of American players. Graeme McDowell fears Europe are due a heavy "beating" sooner rather than later but for Pádraig Harrington, Wednesday's US Ryder Cup team bonding exercise at Jack Nicklaus' Palm Beach home was a compliment to Europe's recent success. "We have made the U.S. guys care, and they really care,” Harrington said after shooting a Friday morning 68. “I saw the guys after the last loss. The older guys were seriously devastated. I can’t tell you how much you could see the devastation of losing. It is a huge deal to Phil and Jim Furyk and guys like that. Wow, were they cut up about losing which is testament to a great event. Everybody cares. It is no longer an exhibition." Graeme McDowell inadvertently revealed that US captain Davis Love III was planning on holding get together at chez Nicklaus and he wishes he could have been there. "I did say to Davis, I’d like to have gone to that dinner," McDowell said with a smile. "That would have been pretty cool to go to Jack’s house and have some dinner. 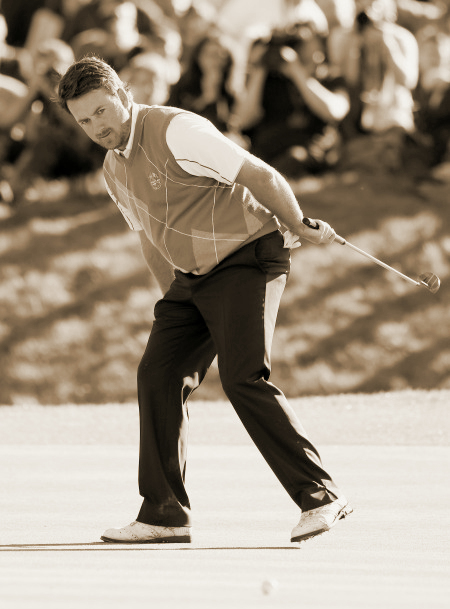 It is exciting for the Ryder Cup, which has gone from strength to strength. It is fuelling the fire for what is a very special golf tournament. The four Ryder Cups I've played in are very special to me and I’d like to play a fifth and a sixth." Like Harrington, McDowell sees the US meeting as a sign that they badly want to win back the Ryder Cup for the first time since the 2008 win at Valhalla, where McDowell made his debut. "You only have to look at the leaderboards and it is not hard to see who the favourites are this year," McDowell said. "They have an incredible team when you look and Rickie and Jordan and Brooks Koepka and Dustin and all these guys playing as well as they are playing. "We are going to go in as underdogs, just the way we like it. It is such a great tournament and it can only build the tournament, win, lose or draw. "To be honest, there so little difference the captain can make to the team. These last few Ryder Cups have come down to small percentages and putting. "Davis did a phenomenal job at Medinah and it was a miracle we came back. He will do a great job but I feel there is a US beating coming down the road and hopefully we can delay that as long as possible because they are awfully good." Harrington does not believe that it is impossible for the Americans to reproduce Europe's sense of camaraderie. But he does admit that it comes easier to the Europeans given the physical nature of the European Tour itself. "The European Tour is different in the sense we travel en masse, we stay in places all together and share cars and buses to and from golf course. "When I played at home the last two summers, I was shocked how much I had missed the social side of everybody going out in a group at night. The Irish go with the Irish, the English with the English. It is just more of a social entity. "If you go to a new venue or city in Europe, you must go and ask somebody where to go and eat. You don't get a car and drive down the road and see a strip mall. Over here you know exactly the kind of experience you are going to get every time you cross the threshold of a restaurant. In Europe, you'd better ask. The likely answer is, we're going here, why don't you join us.' You can't order room service, it is going to be cold, so you have to go out." Harrington sees no reason why the Americans can't reproduce this sense of bonding. "Look, at the end of the day, these results are circumstantial. We are having a good run, the US aren't, everybody is trying to find an answer. I don't think it is as measured as you think it could. Harrington believes the US will be "exceptionally strong" this time. "It is a big ask for the European team," he said before adding with a laugh, "We are playing for the underdog's role again!" Skipper Davis Love and around 25 players, including the injured Tiger Woods, turned up to hear Nicklaus speak to them at his home. “Tiger responded: ‘That’s how everybody thinks I am now, dead! Michael Hoey is now ranked 90th in the world, a career high. Photo Eoin Clarke/www.golffile.ieMichael Hoey has set his sights on what he once thought was the impossible dream - a Ryder Cup cap.